Poolside Drought Tolerant Landscape - Linda Vista Landscape Services, Inc.
With a beautiful pool and to-die-for location, this West Hollywood home needed help on its poolside landscape. Linda Vista Landscape Services created an eye-catching slope to complement the spa-like backyard and add home value. This is the before picture, and you can see that there is quite a slope. Debris from either construction or the old landscape litters the side. What is an advantage in this sloping space is that whatever is put there will be seen. So the first job is to cleanup the debris and level it out to make an even grade. Extra soil was added as well. The wall was also raised, to contain the new landscape. At the other end there was a non-functioning fountain piled into a corner. We wanted to make sure that we built in the piping and auto-workability of that fountain into the slope design to add a stronger stress-free feeling into the landscape. Here’s the beautiful fountain — refurbished and working like a charm! It adds such a relaxing feel with the drip, drip, drip. The whole slope was re-graded, and a variety of drought tolerant plants were added. The existing potted trees were cleaned up and placed nearby. 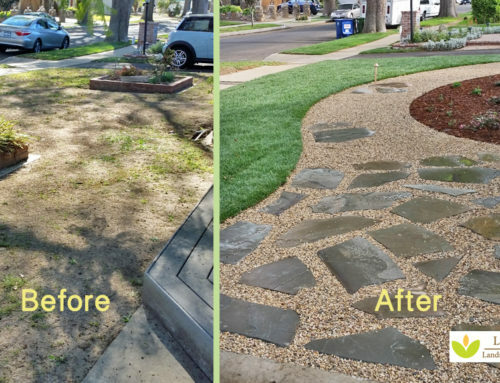 The final look is one of lush water conservation. Rows of dymondia ground cover will fill out as the landscape matures into a low-maintenance, drought tolerant paradise. Water-conserving palms give the design a sub-tropical feel. With the evened-out slope, automatic drip irrigation was installed, as well as heavy mulch to retain the moisture — even in super hot weather. What a beautiful poolside garden!